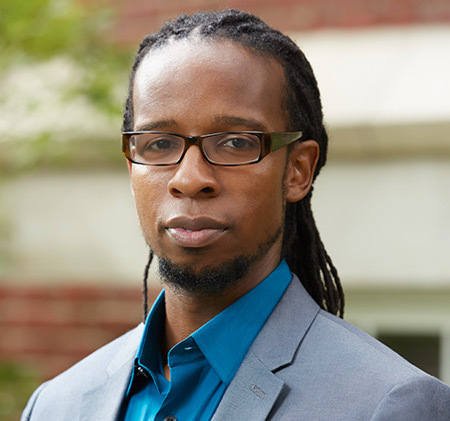 Ibram X. Kendi, one of the nation’s most prolific and accomplished young professors of race, is this spring’s guest speaker as part of the Chancellor’s Dialogue on Diversity and Interdisciplinarity lecture series. “Racist Ideas in America: From Slavery to Black Lives Matter” is the title of Kendi’s discussion, building on his firm belief that in order to understand racism in America today, we must confront the history of anti-black ideas. Kendi traces this history of racist ideas, beginning in 15th-century Europe when racist ideas were used to legitimize the slave trade, through today, when unarmed people being killed by law enforcement officials gave rise to the #BlackLivesMatter movement. In shedding light on the history of racist ideas, Kendi said he hopes to give his audience the tools to expose these ideas along with reasons to hope for the future. Kendi will take the time to meet with faculty members and students, and tour the campus before the lecture. His lecture is open to all and takes place from 4-5 p.m. Friday, May 5, in the Classroom and Office Building 2, Room 110. A reception will follow, and is open to those who attend the lecture. Please RSVP online. Kendi is a New York Times best-selling author and award-winning historian at the University of Florida. His second book, “Stamped from the Beginning: The Definitive History of Racist Ideas in America,” won the 2016 National Book Award for Nonfiction and was recently named a finalist for the 2016 National Book Critics Circle Award. “Stamped” was also nominated for the NAACP Image Award for Outstanding Literary Work in Nonfiction. Described as “engrossing and relentless,” the Washington Post named “Stamped” the most ambitious book of the year. It was also named to Best Books of 2016 lists in the Boston Globe, Kirkus, The Root, Chicago Review of Books and Buzzfeed. The Chancellor’s Dialogue series brings leading scholars to campus to discuss pressing issues confronting higher education today, explicitly linking our core values through a series of conversations and public lectures. Speakers in this series have made lasting contributions to their fields of study and our understandings of interdisciplinary research, and have demonstrated a commitment to broadening opportunities for participation in sciences, engineering, humanities and the arts. The series is sponsored by the Office of the Chancellor and the Office of the Provost, with support and assistance from the Graduate Division. The series highlights UC Merced’s commitment to interdisciplinary research and campus diversity and inclusion — critical components of student success. Kendi’s accomplishments include authoring the award-winning book “The Black Campus Movement: Black Students and the Racial Reconstitution of Higher Education, 1965-1972.” He has published 14 essays in journals and books, as well as many op-eds in a number of publications, including the New York Times, Salon, New York Daily News, the Huffington Post and The Chronicle of Higher Education. He is the associate editor of the leading online platform for public scholarship on black life, Black Perspectives. He has received research fellowships, grants, and visiting appointments from a variety of universities, foundations, professional associations and libraries, including the American Historical Association, Library of Congress, National Academy of Education, Spencer Foundation, Lyndon B. Johnson Library & Museum, Rutgers Center for Historical Analysis, Brown University, Princeton University and Duke University.